Primetime Leisure supply Linked Racing Car Simulators for hire. 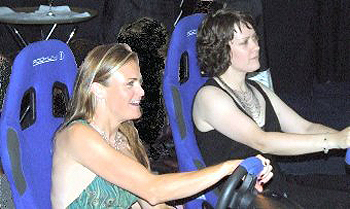 Throughout the UK and Ireland, we have linked Racing Simulator Hire Packages for Parties and Events, Product Launches and Special Exhibition Racing Simulator Packages. Prime Time supply and operate the best in Linked Racing Car Simulation, we supply throughout the UK and Ireland with a wide range of display options including 19″ & 32″ LCD screens and 42″ Plasma Screens. Especially designed and built, these units feature genuine, fully adjustable, Cobra Racing Seats, feedback steering wheels and brake and throttle pedals. These units are purpose built, easy to get in and out of and instantly adjustable for each new driver, do not confuse them with flimsy domestic units. Head to head racing on the same track at the same time, each driver has a unique view through their own windscreen, overtake, bump into one another and race for the finish line. 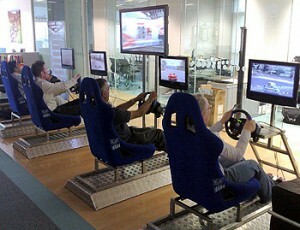 Superb Racing Car Simulator racing action with a wide selection of racing circuits and cars to choose from. 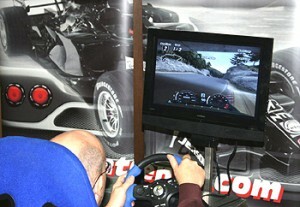 With superb graphics, this is realistic Racing Car Simulator action. Mountings and boards available for promotional material, a fantastic crowd drawing tool without the expense traditionally associated with this type of item. Combined with superb software and a wide range of professionally specified video monitors and displays they bring the best in Racing Simulation to your choice of venue. Set up times are fast and delivery is possible through standard sized doors, for the large screen rigs you will need to allow extra space but the individual monitor rigs can fit into very tight spaces. Ideal for exhibitions and product launches.